Tuesday was always going to be hard – it’s family visiting night, so I’m without my computer for the evening. 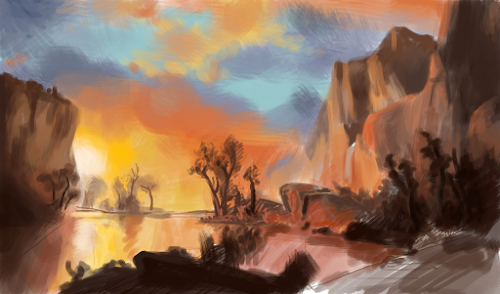 I took my tablet, reckoning I could pull up a painting on my phone and work from that, reprising an old study of Bierstadt’s Sunset Over the Rockies. I reckoned without my phone’s power-saving mode dimming the screen and turning it off every five minutes. Next week I’m taking a book. Today I was back home at my desk and decided to tackle a long-term art-crush, Frederick Edwin Church. 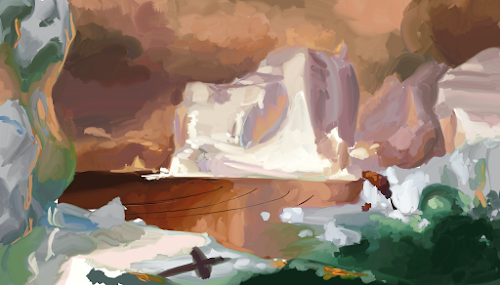 My colours are still too saturated but, on the plus side, I’m getting closer with my colour choices and picking out the underlying structure of the picture is getting easier. This time, I found that, unlike the other painters I’ve studied, Church uses fifths to divide the canvas. Interesting.